The gravestones at Arlington National Cemetery are graced by U.S. flags on Memorial Day. Memorial Day is a United States Federal holiday observed on the last Monday of May. Formerly known as Decoration Day, it commemorates U.S. men and women who died while in military service to their country. First enacted to honor Union soldiers of the American Civil War (it is celebrated near the day of reunification after the civil war), it was expanded after World War I to include American casualties of any war or military action. Today, Memorial Day commemoration includes the flying of the American flag at half staff, a national "moment of remembrance," and a wreath-laying ceremony at Arlington National Cemetery. Local communities often celebrate by having picnics, parades, barbecues, and commemorative ceremonies held in local memorial or town parks. For many though, the connection to war casualties has become somewhat tenuous, and the day has become a holiday that signals the start of the summer season and outdoor activities. However, for as long as there are living veterans of wars, parades in which they participate remind community members of their service and hence the original purpose of the day. Flags flying at Fort Logan National Cemetery during Memorial Day 2006. Following the end of the Civil War in the United States, many communities set aside a day to mark the end of the war or as a memorial to those who had died. The first unofficial observance of a memorial day was in 1865 by liberated slaves at the historic race track in Charleston, South Carolina. The site was a former Confederate prison camp as well as a mass grave for Union soldiers who died in captivity. The freed slaves re-interred the dead Union soldiers from the mass grave to individual graves, fenced in the graveyard, and built an entry arch declaring it a Union graveyard. This was a daring action for them to take in the South shortly after the North's victory. On May 30, 1868, the freed slaves returned to the graveyard with flowers they had picked from the countryside and decorated the individual gravesites. A parade by thousands of freed blacks and Union soldiers from the area was followed by patriotic singing and a picnic. Some other places creating an early memorial day include Sharpsburg, Maryland, located near Antietam Battlefield; Boalsburg, Pennsylvania; Richmond, Virginia; Carbondale, Illinois; Columbus, Mississippi; and many communities in Vermont. These observances coalesced around Decoration Day which honored the Union dead, and the several Confederate Memorial Days. The official "birthplace" of Memorial Day is Waterloo, New York. The village was credited with being the place of origin because it observed the day on May 5, 1866, and each year thereafter. The friendship between General John Murray, a distinguished citizen of Waterloo, and General John A. Logan, who helped bring attention to the event nationwide, was a factor in the holiday's growth. Logan had been the principal speaker in a citywide memorial observation on April 29, 1866, at a cemetery in Carbondale, Illinois, an event that likely gave him the idea to make it a national holiday. On May 5, 1868, in his capacity as commander-in-chief of the Grand Army of the Republic, a veterans' organization, Logan issued a proclamation that "Decoration Day" be observed nationwide. It was observed for the first time on May 30 of the same year; the date was chosen because it was not the anniversary of a battle. 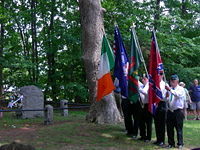 The tombs of fallen Union soldiers were decorated in remembrance. Many of the states of the U.S. South refused to celebrate Decoration Day, due to lingering hostility towards the Union Army and also because there were relatively few veterans of the Union Army who were buried in the South. A notable exception was Columbus, Mississippi, which on April 25, 1866, at its Decoration Day commemorated both the Union and Confederate casualties buried in its cemetery. This act of generosity and reconciliation prompted an editorial published by Horace Greeley's New York Tribune, and a poem by Francis Miles Finch, The Blue and the Grey, published in the Atlantic Monthly. Troops at the Washington, D.C. Memorial Day parade, 1942. The alternative name of "Memorial Day" was first used in 1882. It did not become common until after World War II, and was not declared the official name by Federal law until 1967. On June 28, 1968, the United States Congress passed the Uniform Holidays Bill, which moved three holidays from their traditional dates to a specified Monday in order to create a convenient three-day weekend. The holidays included Washington's Birthday, now celebrated as Presidents' Day; Veterans Day, and Memorial Day. The change moved Memorial Day from its traditional May 30 date to the last Monday in May. The law took effect at the federal level in 1971. After some initial confusion and unwillingness to comply, all 50 states adopted the measure within a few years. Veterans Day was eventually changed back to its traditional date. Ironically, most corporate businesses no longer close on Veterans Day, Columbus Day, or President's Day, with the day after Thanksgiving, Christmas Eve, and/or New Years Eve often substituted as more convenient "holidays" for their employees. Memorial Day endures as a holiday which most businesses observe because it marks the beginning of the "summer vacation season." This role is filled in neighboring Canada by Victoria Day, which occurs either on May 24 or the last Monday before that date, placing it exactly one week before Memorial Day. Many people observe Memorial Day by visiting cemeteries and memorials. 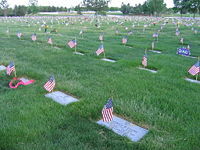 Volunteers usually place an American flag upon each grave site located in a National Cemetery. A national moment of remembrance takes place at 3:00 p.m. U.S. Eastern Standard Time. There is a wreath-laying ceremony often conducted by the U.S. President at the Tomb of the Unknowns at the Arlington National Cemetery. Another tradition is to fly the U.S. flag at half-staff from dawn until noon local time. Many Americans also use Memorial Day to honor other family members who have died. 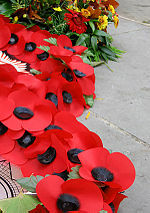 The poppy emblem was chosen because of the poppies that bloomed across some of the worst battlefields of Flanders in World War I, their red color an appropriate symbol for the bloodshed of trench warfare. In addition to remembrance, Memorial Day is also used as a time for picnics, barbecues, family gatherings, and sporting events. One of the longest-standing traditions is the running of the Indianapolis 500, an American automobile race at the Indianapolis Motor Speedway in Speedway, Indiana, which has been held in conjunction with Memorial Day since 1911. Traditionally, Memorial Day is celebrated by most Americans as the symbolic beginning of the summer. Memorial Day formerly was observed on May 30. The Veterans of Foreign Wars (VFW) and Sons of Union Veterans of the Civil War (SUVCW) advocate returning to this fixed date, although the significance of the date is tenuous. Since 1987, Hawaii's Senator Daniel Inouye, a World War II veteran, has introduced measures to return Memorial Day to its traditional date. The VFW stated in a 2002 Memorial Day Address, "Changing the date merely to create three-day weekends has undermined the very meaning of the day. No doubt, this has contributed to the general public's nonchalant observance of Memorial Day." Color guard as part of ceremony at Ox Hill Battlefield Park on Memorial Day 2007. In addition to national observances, many individual communities hold memorial observance for fallen soldiers who were from that town by holding a ceremony in a church or town memorial park. It is common for fire and police departments to remember and honor members lost in the line of duty. Towns often hold a Memorial Day parade in honor of such residents. Participation in such a parade is by community organizations such as members of the local emergency services and their vehicles, Rotary Clubs, Boy Scouts, Girl Scouts, and bands from the local high school or church groups, American Legion and Sons of the American Legions. Communities may hold a picnic barbecue at a local park in which the whole town is invited to attend. Charles Ives' symphonic poem Decoration Day depicted the holiday as he experienced it in his childhood, with his father's band leading the way to the town cemetery, the playing of Taps on a trumpet, and a livelier march tune on the way back to the town. It is frequently played with three other Ives' works based on holidays, such as the second movement of A New England Holidays Symphony. The southeastern U.S. celebrates Decoration Day as a day to decorate the graves of all family members, and it is not reserved for those who served in the military. The region observes Decoration Day on the Sunday before Memorial Day. Jason Isbell of the rock band Drive-By Truckers chronicled such an event in his epic ballad Decoration Day. ↑ David Blight, Race and Reunion: The Civil War in American Memory (Cambridge, MA: Belknap Press of Harvard University Press, 2001, ISBN 0674008197). ↑ Trinity River Seminars and Consulting, Conversations in Management, Trinity River Seminars and Consulting, 2007. Retrieved December 19, 2008. ↑ Veterans of Foreign Wars of the United States, Buddy Poppy. Retrieved December 18, 2008. ↑ Rob Ruggenberg, The making of "In Flanders Fields," The Heritage of the Great War, 2008. Retrieved December 19, 2008. ↑ David Merchant, Memorial Day History, January 22, 2008. Retrieved December 19, 2008. Blight, David. Race and Reunion: The Civil War in American Memory. Cambridge, MA: Belknap Press of Harvard University Press, 2001. ISBN 0674008197. Brownstein, Karen Osney. Memorial Day. Staten Island, NY: PaperJacks, 1987. ISBN 978-0770105655. Harmond, Richard P., and Thomas J. Curan. A History of Memorial Day: Unity, Discord and the Pursuit of Happiness. New York, NY: P. Lang, 2002. ISBN 978-0820439594. Leber, Sally Speer. Memorial Day. Columbus, OH: Zaner-Bloser, 2005. ISBN 978-0736711661. McSpadden, J. Walker. The Book of Holidays. New York, NY: Crowell Editions, 1958. ISBN 0690152248. This page was last modified on 14 September 2018, at 19:22.